When I was younger, I wanted to be an archaeologist. 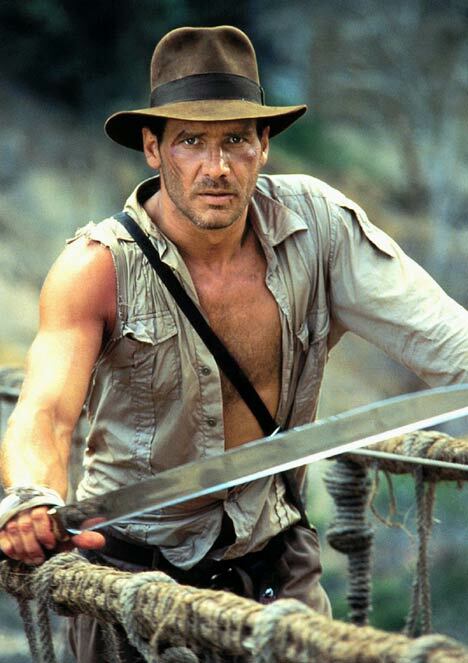 I SO wanted to be Indiana Jones. I have the fedora, the leather jacket (even though mine is the biker version), not the bullwhip, but hey. I listened to the theme music again today, and got inspired again. I wanted to find my dig kit, grab my trowel, lay out a square, and excavate. So what if I didn't find anything when I got to 6 feet down? But then I thought hard. I'm the Fearless Farm Frau. I have a family, critters to care for, and a home to look after. Archaeology usually involves moving around a lot. And really, what IS archaeology? Stop here and take a minute to think. It's the pleasure of finding. When you unearth those bones or sherds or arrowheads, you've connected with someone. You never knew them, but now you do. You can say "pleased to meet you" to someone you'll never meet in person (unless you count holding their bones or their carefully made utensils in your hands). From what they left behind, you can get a feel for what kind of person they were--meticulous or sloppy? Hunter or Homemaker? But you've found something special. No, I'm not out with my handy trowel anymore, but I am taking pleasure in finding. Finding that warm egg on a cold morning. Finding friends in unexpected places. Finding that new recipe I can't wait to try. Finding new ways to interact with my friends and family that will enrich all of us. Finding out more about my ancestors that I didn't know about before. So even though I'm not in the dirt all the time, there is much pleasure to be found. Every day presents its own gem. I'm still rather hoping to come across a site out here, but I have my hands full with all of my other findings. It's all in the pleasure you take in finding. Take this thought with you today: if you never look, you'll never find. Whatever you find is always valuable in some way. Even negatives can be turned into positives and you can take pleasure in the finding.